Original Editors - Dana Johnston from Bellarmine University's Pathophysiology of Complex Patient Problems project. Hyperthyroidism, often referred to as thyrotoxicosis, is a disorder that occurs when the thyroid gland secretes excessive amounts of thyroxine (T4) and/or triiodothyronine (T3). T4 and T3 are thyroid hormones that are responsible for regulating a person’s basal metabolism and increasing metabolic activity and protein synthesis . An excess amount of thyroid hormone leads to an increased metabolic rate, which affects almost every system in the body . Hyperthyroidism is four times more prevalent in females. Women between the ages of 20-40 are even more prone to developing this disease. Graves' disease, an autoimmune disease, is the most common type of hyperthyroidism, comprising approximately 85% of cases . People with hyperthyroidism may present with a variety of symptoms depending on the person’s age, the quantity of excess hormones, the period of time the person has been sick, and the presence of a comorbid condition . It is often difficult to detect the disease in older adults because they do not present with many of the typical signs and symptoms. Instead, they will often appear to have other illnesses, such as heart disease, depression, or dementia. Older people also tend to act more apathetic than hyperactive, and are more likely to have cardiovascular problems . In addition to tachycardia, fatigue and weight loss which are commonly seen in adults over 70, people younger than age 50 will also typically display hyperactive reflexes, increased perspiration, heat intolerance, tremor, nervousness, polydipsia, weakness, increased appetite, dyspnea, and weight loss despite normal food intake . Women may also notice a change in their menstrual cycles . Emotions can also become affected, causing a person’s moods to cycle between a euphoric state and acting hyperactive to feeling depressed and acting delusional . 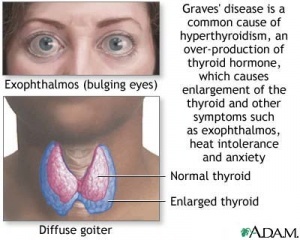 In addition to the signs and symptoms previously mentioned, two key features of people with Graves’ disease are an enlarged thyroid gland (goiter) and exophthalmos which occurs in approximately 50% of people with the disease . Exophthalmos is an abnormal protrusion of the eyes which occurs as tissue and muscles behind the eye become inflamed causing the eyelids to retract . Graves’ dermopathy, also called pretibial myxedema, is a very rare condition that if seen nearly always occurs in patients who have severe Graves' ophthalmopathy. The condition appears as reddening and swelling of the skin, most commonly seen on the shins and the dorsum of the foot . In a patient with untreated, incorrectly treated, or undiagnosed hyperthyroidism, a stressful situation, such as surgery, labor, MI, pulmonary embolism, or medication overdose may cause an acute episode of thyroid over activity to occur. This event is known as thyroid storm, a rare complication of hyperthyroidism that is characterized by a high fever, tachycardia, dehydration, delirium, and extreme irritability . Chronic periarthritis and calcific tendinitis are also associated with hyperthyroidism. They both tend to occur in the shoulder, causing limitations in a person’s ROM, which may progress and lead to adhesive capsulitis. These conditions are both common in people who have endocrine disease. Once the underlying hyperthyroidism is treated, chronic periarthritis will usually resolve as well. Approximately 70% of people with hyperthyroidism will develop weakness in the proximal muscles, such as the hips, which is accompanied by myopathy. Muscle strength generally returns after two months of treatment. Muscle atrophy will take a longer period of time to restore . Beta blockers such as propranolol are often used to treat the adrenergic symptoms of hyperthryoidism, such as tachycardia, palpitations, heat intolerance, and anxiety. Beta blockers are used as the first line of treatment before surgery, radioactive iodine, and antithyroid drugs. They are also used for short-term therapy in pregnancy. This medication should be used with caution in the elderly, patients with heart disease, COPD, or asthma. Calcium channel blockers can also be used to reduce the heart rate in patients who are unable to tolerate beta blockers. Iodides block the conversion of T4 to T3 and inhibit thyroid hormone release. They are sometimes used before surgery or during pregnancy when other medications are ineffective or contraindicated. They are also used in conjunction with antithyroid drugs to treat amiodarone induced hyperthyroidism. Iodides are not used routinely to treat hyperthyroidism because of paradoxical increases in hormone release that can occur with prolonged use. Complications of iodides include they can interfere with the response to radioactive iodine and they may prolong the time it takes to reach a normal thyroid level with antithyroid drugs. Toxic multinodular goiter: Accounts for approximately 5% of cases in the U.S. It is much more common in countries where iodine deficiency is more prevalent. This condition usually occurs in people over age 40 that have had a goiter for an extended period of time. Toxic adenoma: This condition also occurs rarely in the U.S. It is common in the younger population in iodine-deficient countries. Subacute thyroiditis often occurs following a viral illness. Symptoms usually resolve in eight months, and may occur repeatedly in some people. Lymphocyctic and Postpartum are both types of thyroiditis that last for a short duration of time. Postpartum thyroiditis occurs in around 5-10% of women in the first 3-6 weeks after delivery. It is common for a person to experience hypothyroidism briefly before the condition resolves. The approach taken to treat hyperthyroidism depends on the cause of the disease, the severity of the patient’s symptoms, and the presence of other medical conditions. The three main treatments used are antithyroid medication, radioactive iodine, and surgery. Beta blockers and iodides may also be used as treatment adjuncts. Antithyroid drugs work by blocking the thyroid gland’s ability to make new thyroid hormone. These drugs are the choice of therapy during pregnancy or breastfeeding, for children under the age of 12 years, for people with severe Graves’ disease, and as a pretreatment for older adults, cardiac patients, or patients with toxic nodular or multinodular goiter before radioactive iodine or surgery. About half of the people treated with antithyroid drugs have a later recurrence of hyperthyroid activity. Relapse is higher in smokers, patients with large goiters, and patients with positive thyroid-stimulating antibody levels at end of therapy. Major side effects include rheumatoid-like arthritis and agranulocytosis, which usually resolve after 10 days of discontinuing the drug. Minor side effects include rash, fever, gastrointestinal effects, and arthralgia. Liver damage is another very rare side effect. Another way to treat hyperthyroidism is to damage or destroy the thyroid cells that make thyroid hormone. Radioactive iodine (RAI) is recommended as the first-line therapy in anyone older than 18 y/o that is not pregnant. RAI has an 80% single dose cure rate. This high cure rate has led to approximately 70% of adults in the United States now given this form of treatment. Sometimes patients will remain hyperthyroid and a second radioiodine treatment is given. However, in most cases hypothyroidism develops within the first year after therapy. Eventually the thyroid will normalize with replacement therapy consisting of a thyroid hormone supplement taken once a day. Side effects of RAI include transient neck soreness, flushing, and decreased taste. When is a medial referral required? Anytime a therapist discovers unusual swelling or enlargement (with or without pain), tenderness, hoarseness, or dysphagia they should refer out. If your patient experiences fever, rash, arthralgia, or other side effects of antithyroid drugs, notify their physician because it may be possible to use another form of treatment. What should I monitor during treatment session? Vital Signs: This is especially important if the patient is an older adult, has CAD or previous hx of heart disease, or presents with signs of dyspnea, fatigue, tachycardia, and/or arrhythmia. Watch for signs of hypoparathyroidism such as muscular twitching, tetany, numbness, and tingling around mouth, fingertips, or toes if patient is post thyroidectomy. Hypoparathryoidism may result 1-7 days after thyroidectomy if there are complications during the surgery resulting in unintentional removal of part of the parathyroid glands. When working with patients who have been given RAI, be aware their saliva is radioactive for 24 hours following their treatment. When working with these patients it is important to take the necessary precautions if the patient is coughing or expectorating. Some patients with Graves’ disease suffer from heat intolerance, making exercising in a hot pool a contraindication to therapy. This patient would still be able to participate in aquatic therapy in a warm pool; given the patient’s body temperature is being monitored. Typically heat intolerance is associated with thyroid storm, and will normally not occur in clients attending therapy in outpatient settings. Hyperthyroidism is associated with exercise intolerance and reduced exercise capacity. Many patients with hyperthyroidism suffer from cardiopulmonary complications often leading to atrial fibriliation, CHF, and increased risk of a MI. Chronic periarthritis and calcific tendinitis are also associated with hyperthyroidism. They both tend to occur in the shoulder, causing limitations in a person’s ROM, which may progress and lead to adhesive capsulitis. Therapeutic interventions using ultrasound, joint mobilizations, stretching, and strengthening may be performed once the thyroid gland is regulated. Research suggest a 6 week treatment period using pulsed US for 15 minutes at 2.5 W/cm2 at a frequency of .89 MHz is associated with short term improvement in pain levels and quality of life in adults with calcific tendonitis. hyperthyroid patients complaining of myalgias after starting treatment. The FDA has issued an alert regarding the risk of liver failure with the use of propylthiouracil, a popular antithyroid drug. The alert is based on 32 case reports of 22 adults and 10 children--12 of the adults died and five needed liver transplantation; one of the children died and six needed liver transplantation. ↑ 1.00 1.01 1.02 1.03 1.04 1.05 1.06 1.07 1.08 1.09 1.10 1.11 1.12 1.13 1.14 1.15 Goodman C, Fuller K. Pathology: Implications for the Physical Therapist. St. Louis, Missouri: Saunders Elsevier; 2009. ↑ 2.0 2.1 2.2 2.3 2.4 2.5 Goodman C, Snyder T. Differential Diagnosis for Physical Therapists: Screening for Referral. St. Louis, Missouri: Saunders Elsevier, 2007. ↑ 3.0 3.1 3.2 3.3 3.4 3.5 3.6 3.7 Reid J, Wheeler S. Hyperthyroidism: diagnosis and treatment. American Family Physician 2005 Aug 15; 72(4): 623. Available at http://www.aafp.org/afp/2005/0815/p623.html (accessed 24 Feb 2010). ↑ 4.0 4.1 Mayo Clinic. Symptoms. http://www.mayoclinic.com/health/graves-disease/DS00181/DSECTION=symptoms (accessed 24 Feb 2010). ↑ American Thyroid Association, Hyperthyroidism Brochure , 2005. http://www.thyroid.org/patients/brochures/Hyper_brochure.pdf (accessed 1 April 2010). ↑ Lioté F, Orcel P. Osteoarticular disorders of endocrine origin. Baillière's Best Practice & Research. Clinical Rheumatology [serial on the Internet]. (2000, June), [cited April 18, 2010]; 14(2): 251-276. Available from: MEDLINE. ↑ Aly N. Subclinical hyperthyroidism: features and treatment. Geriatric Medicine [serial on the Internet]. (2007, Nov), [cited April 18, 2010]; 37(11): 17. Available from: CINAHL with Full Text. ↑ Schraga, Erik. Hyperthyroidism, Thyroid Storm, and Graves Disease: Differential Diagnoses & Workup. 3 June 2009. http://emedicine.medscape.com/article/767130-diagnosis. (accessed 11 April 2010). ↑ Duha S, Caroline S. K. Myositis Associated with the Decline of Thyroid Hormone Levels in Thyrotoxicosis: A Syndrome?. Thyroid [serial on the Internet]. (2009, Dec), [cited April 18, 2010]; 19(12): 1413-1417. Available from: Academic Search Premier. ↑ Aschenbrenner D.. TREATMENT FOR GRAVES' DISEASE POSES RISK OF LIVER FAILURE. The American Journal of Nursing [serial online]. 2009;109:33. Available from: Research Library Core. Accessed March 28, 2010, Document ID: 1937632561. ↑ Birmingham C, Gutierrez E, Gritzner S. Hyperthyroidism in anorexia nervosa: Case report and review of the literature [electronic resource]. International journal of eating disorders [serial on the Internet]. (2006, Nov), [cited March 28, 2010]; 39(7): 619-620. Available from: Agricola.